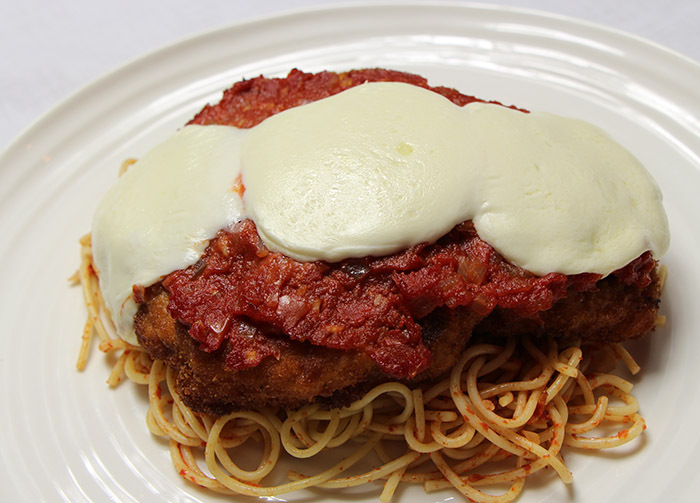 This chicken parmesan recipe is a classic Italian dinner. I use fresh mozzarella for a truly authentic and delicious dinner that can be made any night of the week. Heat oven to 425 degrees. Trim chicken breasts of tenders and any fat and/or tendons. I have found that filleting the chicken breast in half and then pounding them slightly give the chicken a great thickness that cooks quickly (leaving the breast very juicy) and is very tender. Place the breasts on your board and with one hand on the top of the breast run your knife through the center of the breast. To pound out the breast, place a piece of saran wrap about 16 inches long on your board and place chicken on left or right hand side of plastic, and fold the remaining piece of plastic over the chicken. With the smooth side of a meat pounder, pound out the chicken using downward and outward motions. Pound chicken until breast is approximately 3/8 to a 1/4 inch in thickness. Using 3 separate bowls or baking dishes, in the first place the flour and 1 tsp. of kosher salt and freshly ground pepper. Mix well. In the next bowl mix the egg and milk. In the 3rd bowl you will have the bread crumbs. Dredge the breast in the flour and shake off the excess. Place it in the egg wash and coat the breast, letting the excess wash drain back into the bowl. Finally, dredge the breast in the bread crumbs, place on a sheet pan near your cook top or stove and repeat with the remaining breasts. Over medium-high heat, heat up a 10-inch skillet with about a ¼ inch of oil in it until the oil is simmering. Place 1 or 2 of the breasts in the hot oil and cook until golden-brown on the bottom. Turn breast over and cook for an additional 2-3 minutes. Place on a paper towel-lined plate and repeat with remaining breasts. Drop your pasta into boiling water. Add pasta to desired doneness as per the instructions on the box. Once water comes back to a boil, lower heat to medium-high and stir pasta occasionally. Place breasts on a clean sheet pan lined with foil and ladle the prepared sauce over the top of each breast just to cover. Place 2 pieces of mozzarella over the sauce and bake until cheese is just melted and chicken is cooked through, about 5-6 minutes. Chicken is done when the Insta-Read thermometer shows 165 degrees. The chicken will probably be cooked through from the frying process…but should be done with this quick blast in the oven to melt the cheese! Drain pasta and coat with remaining sauce. Plate pasta first followed by the breasts, sprinkle with parmesan cheese.